Cyclist putting on helmet. 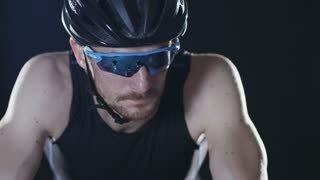 Healthy man wearing helmet and cycling glasses riding bicycle. Fitness workout indoors on black background. Exercise in gym. Medium close up. Sport cyclist in goggles and helmet and tight outfit 001. 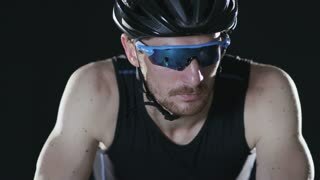 Healthy man wearing helmet and cycling glasses riding bicycle. Fitness workout indoors on black background. Exercise in gym. Medium close up. 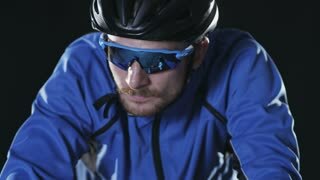 Cyclist workout in profile wide shot 002.Healthy man wearing helmet and cycling glasses riding bicycle. Fitness workout indoors on black background. Exercise in gym. Wide shot. Sport cyclist in goggles and helmet and tight outfit 002. 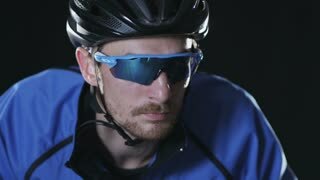 Healthy man wearing helmet and cycling glasses riding bicycle. Fitness workout indoors on black background. Exercise in gym. Medium close up. Sport cyclist in goggles and helmet and tight outfit 008. Healthy man wearing helmet and cycling glasses riding bicycle. Fitness workout indoors on black background. Exercise in gym. Medium close up. Cyclist workout in profile wide shot 001. Healthy man wearing helmet and cycling glasses riding bicycle. Fitness workout indoors on black background. Exercise in gym. Wide shot. Cyclist in shirt and helmet 004. Healthy man wearing shirt and helmet riding bicycle and working out. Fitness indoors on black background. Exercise in gym. Medium close up. Sport cyclist in goggles and helmet and tight outfit 004. Healthy man wearing helmet and cycling glasses riding bicycle. Fitness workout indoors on black background. Exercise in gym. Medium close up. Sport cyclist in goggles and helmet and tight outfit 005. Healthy man wearing helmet and cycling glasses riding bicycle. Fitness workout indoors on black background. Exercise in gym. Medium close up. Cyclist in shirt and helmet 002. Healthy man wearing shirt and helmet riding bicycle and working out. Fitness indoors on black background. Exercise in gym. Medium close up. Sport cyclist in goggles and helmet and tight outfit 007. Healthy man wearing helmet and cycling glasses riding bicycle. Fitness workout indoors on black background. Exercise in gym. Medium close up. Cyclist in shirt and helmet 001. Healthy man wearing shirt and helmet riding bicycle and working out. Fitness indoors on black background. Exercise in gym. Medium close up. Sport cyclist in goggles and helmet and tight outfit 003. Healthy man wearing helmet and cycling glasses riding bicycle. Fitness workout indoors on black background. Exercise in gym. Medium close up.